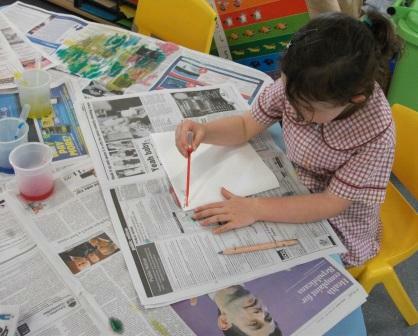 Over the last few weeks, one of the children in my class has been totally engrossed in using pippettes. Her interest was piqued when we were experimenting with milk, paint and detergent to create a Storm in a Saucer. Initially she had difficulty using the pippettes and needed lots of help. After several days we ran out of milk and as her interest was still very strong, I put out paper towels and water paint to give her further opportunities for practice and exploration. Each day she would sit for long periods of time dropping paint onto the paper, and with every day that passed she developed more and more control over the pippettes until she was able to drop the paint skillfully wherever she wanted it on the paper. As I observed her persistence and total engagement with the process, I was reminded of just how important it is to give children opportunities to practise and master skills. Life at school can be very busy and in our haste to provide our children with lots of different learning opportunities and experiences I sometimes wonder if, in some respects, we are teaching children to become a jack of all trades and master of none. If I had stopped putting out the pippettes after the first experiment, would my young preppie have been disadvantaged in terms of fine motor development? Probably not. There are plenty of other opportunities for developing fine motor skills in our classroom. Would she have continued to explore colour? Probably, because this is a strong interest in our classroom at the moment and there are, again, lots of opportunities for colour exploration and experimentation. Would she have gained a deep understanding of the science involved in using pippettes and the skill of controlling this tool, not just for art but for other learning areas as well? Probably not. 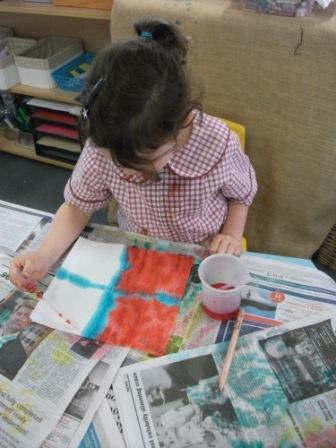 Without this deep understanding would she be able to apply the knowledge she has gained, to create patterns and other imaginative representations? Probably not. Would her self esteem and personal learning skills have been enhanced without the opportunity to persist in using the pippettes? Probably not. As a teacher I need to consider the bigger picture. By giving her time and plenty of opportunity to practice, this young child has learnt so much more that the original learning intention of the first experiment. She has mastered a useful tool, she has gained deep understandings about the science of pippettes through experimentation, trial and error, thinking and problem solving and is able to apply this knowledge to other situations. Her self esteem has been enhanced as she progressed from squirting the entire amount of paint out in 1 squeeze to being able to carefully control where and how much paint is dropped out. I loved watching her engagement in the process, her complete focus and intense concentration and whilst she would leave the activity to do other things she would continue to return and explore and experiment. She was setting her own challenges using her interests and thinking and problem solving whilst persisting to build her skill base. Something that I strive for when facilitating a child negotiated, play based curriculum. You are so right. This is something I am trying hard to ensure I do at the moment – really giving them time to wallow in their experiences, rather than rushing from one to the next.